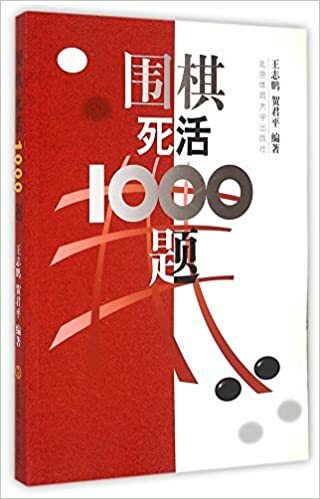 Weiqi Life and Death 1000 Problems (圍棋死活1000題) is a Chinese tsumego & tesuji book edited by Wang Zhipeng (王志鵬) and published by Beijing Sport University Press (北京体育大学出版社) in 2000. It is 385-pages in length with 1000-problems & solutions. The problems are categorized into two main sections: tsumego and tesuji; then further broken into 10 and 15 thematic subsections respectively. Solutions appear after each of the two main sections. As the problem difficulty increases the solution section begins to include three diagrams: Solution, Continuation/Variation and Failure. 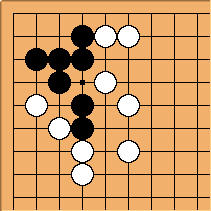 The tesuji section of the book ranks the problems from one to three stars based upon difficulty. The original retail price was RMB 30. It is currently available to western audiences at Yellow Mountain Imports for $19.99: http://www.ymimports.com/p-1631-weiqi-life-and-death-1000-problems.aspx. The problems are arranged thematically. A method of making life is drilled through a number of problems. A new method is introduced and both are drilled. The thematic repetition makes this book an excellent teaching tool both for classes and the self-taught. The problems are presented twelve to a page while the answers are presented nine to a page, so checking answers is a little less convenient than if the page formats matched. The answer diagrams are the same size as the problem diagrams but have accompanying Chinese text, presumably this is the reason for the twelve vs nine discrepancy. The cover is rather thin, so more careful handling is recommended than is the case for a number of other books. Logan? : I think that the best suited audience for this book is 1k~3d. A 5k~2k could probably solve many of the 1-star problems, but may have trouble with the deep reading of some of the 2-star and above problems. Thus, as a whole I would advise the latter audience to wait until they reach the recommended range to receive the most from this book. The first half of the book (life and death problems) is very good. The organization of the problems in each set build very well together. This section of the book cannot be recommended highly enough. The second half of the book (tesuji problems) are riddled with incorrect diagrams (e.g. #90, pg. 202), unaddressed kos (e.g. #49, pg. 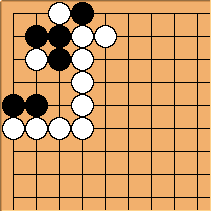 197), unaddressed multiple solutions (e.g. #83, pg. 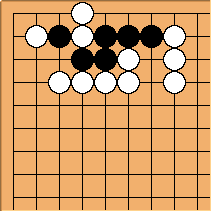 201) and incorrect solutions (e.g. #80, pg. 201). The kos and multiple solutions may be addressed in some Chinese preface text that I cannot read, but the other two issues cannot be qualified. So would I still recommend this book despite the dismal second part? Yes, I would. 20$ (excluding shipping) for ~500 life and death problems is still a good deal on the English market; and the organization and problems in this section are fantastic. Despite the bad aspects of the second part: there are many problem which are correct, the sections still have a nice conceptual organization (albeit more difficult than the life and death section), and there are many interesting problems that one may like to share and solve with others. Niklaus: I picked this book up in China, and I love it. The problems are very interesting and well organized. 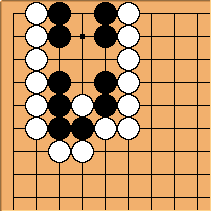 Highly recommended to strong kyu players and dan players.